Alice Donnes was born in Benalla around 1878, a daughter of John Donnes and Anges Miller. John was a Wesley Minister at the Yackandandah Wesleyan Church. He died in 1884 after a long illness leaving Agnes and eight children. Members of the church donated money to support the family. Agnes took her family to Melbourne and in 1888 they were living in Bay Street, Port Melbourne. 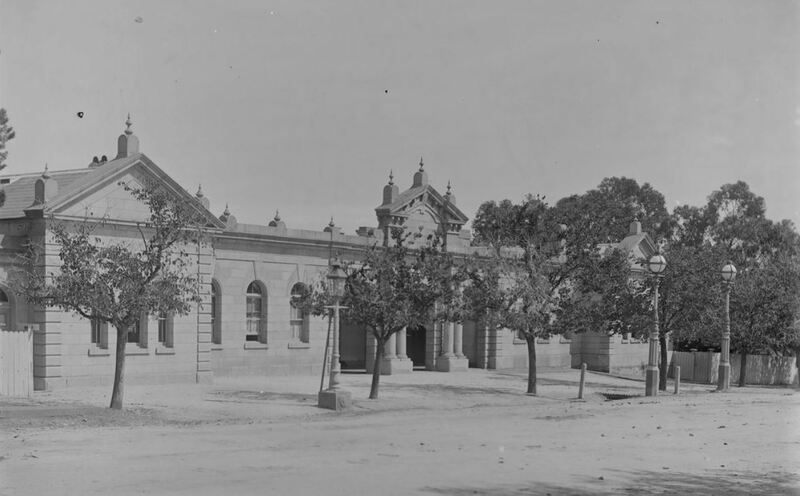 Alice took up nursing and in 1904 was working at the Ovens District Hospital at Beechworth (below). 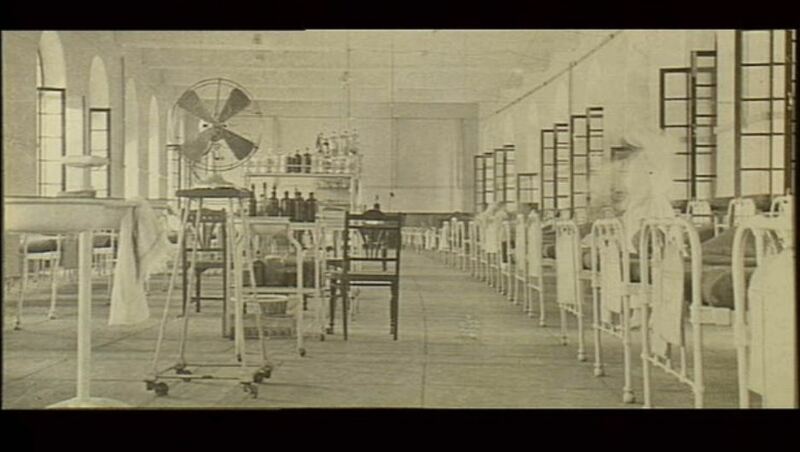 She resigned in 1905 to complete further training at the Women’s Hospital in Melbourne. In 1911, Alice took a trip to London and on her return was offered a six-month appointment at the Ovens District Hospital from May 1912. In August that year she requested a pay increase of £60 per annum, however, she was told it would only be considered after her six-month term ended. She did not pursue it but rather resigned at the end of her tenure and took up a place at the Hamilton Hosptial. In May 1914, with Matron Grewer on leave, Alice was appointed Acting Matron. A year later, Matron Grewer enlisted and again Alice was Acting Matron. A month later when it was clear Matron Grewer wasn’t going back to Hamilton any time soon, Alice was officially appointed Matron. It was a difficult time at the hospital with a shortage of nurses. At the ordinary monthly meeting of the Hamilton Hospital committee in January 1916, two pieces of correspondence from Alice were read. Firstly, she thought the conditions of service for nurses at the hospital were too strict, making it difficult if they needed time off work for minor illnesses. Her second piece of correspondence was to tell the committee she had been accepted for active service and expected to leave by the end of February. She was forty-one. 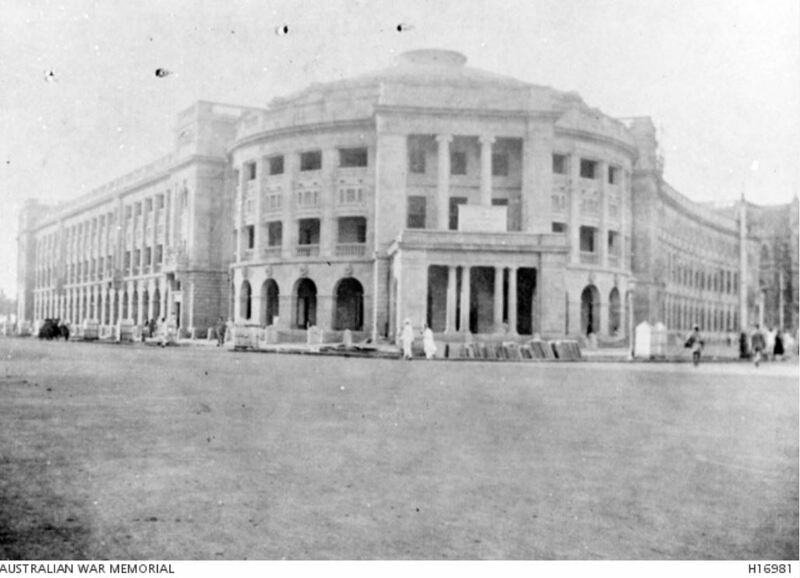 Alice arrived in Bombay on 30 July 1916 and was posted to the Gerard Freeman Thomas Hospital (below). Alice remained in India until July 1918 when she went to the 2nd Stationary Hospital at Maymyo, Burma. She was repatriated to Australia on 18 August 1918 after fifteen months overseas. The news was conveyed to the Hamilton Hospital committee and they expected she would resume duty as Matron “at a later date”. She returned first to Castlemaine in mid-September 1918. Her mother was living in the town and Alice was met at the station by “cheering crowds”. A special function was held in her honour hosted by the Castlemaine Mayor. Alice returned to Hamilton on 23 October and she resumed as matron at the hospital. 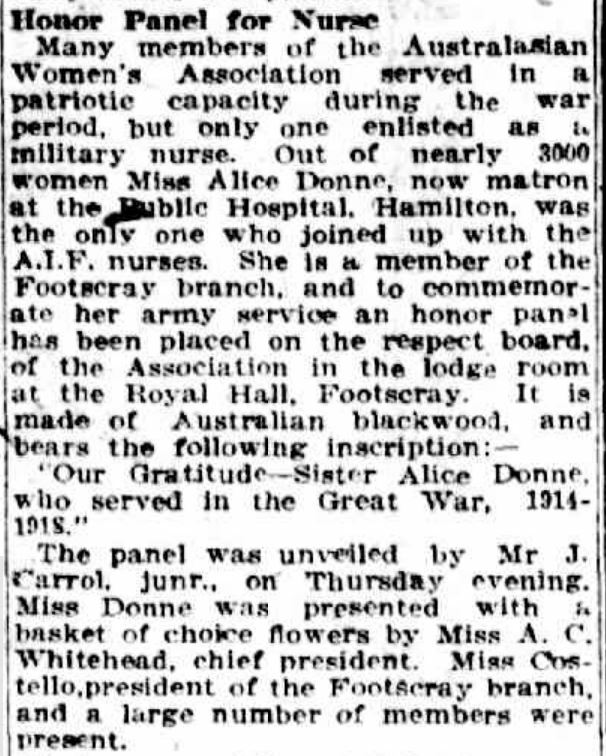 Prior to her enlistment, Alice was a member of the Footscray branch of the Australasian Women’s Association. She was the only member who joined with the AIF nurse and she was commemorated on the branch’s respect board at the Royal Hall, Footscray. “Events of the Day” The Herald (Melbourne, Vic. : 1861 – 1954) 16 November 1920: 6. Web. 15 Sep 2018 <http://nla.gov.au/nla.news-article242239445&gt;. In August 1929, Alice requested a testimonial from the hospital committee as she didn’t expect to be at the hospital much longer. Her reasons were published in the Horsham Times of 20 August 1929. She told the committee “good health was an asset, and she did not want to lose hers”. She was not pleased about newspaper reports about the management of the matron. It had hurt her because she didn’t deserve such remarks in the paper. Her greatest crime had been that she had risen early and sat up late in the interests of the hospital. 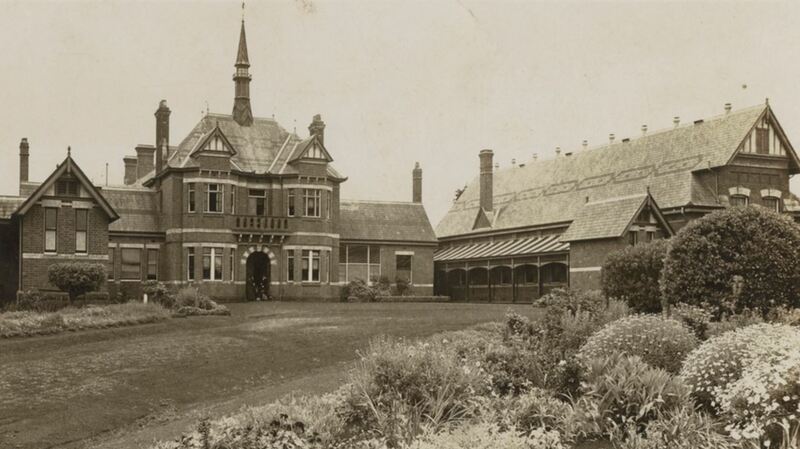 It was on account of the efficiency of the hospital and its 100 per cent passes obtained by the nurses(the McKellar Hospital was first on the list of training schools) that she had been chosen as one of the four lady superintendents on the council of the Royal Victorian Trained Nurses’ Association. She was the first superintendent of a country hospital to be chosen for that position. She had had a very moderate staff. She did not have all the domestic staff she was credited with, for that report include temporary staff. An assistant had not been replaced, but she did not intend to do without her. When one had been a long time in a place, one naturally looked on it a:s one’s own. If she left, it would not be because she wanted to leave, but she could never be a mere machine. The council had told her that she was entitled to the testimonial, which was equivalent to a matron’s certificate. A new matron was appointed, taking up duties on 8 January 1930. By February 1930, Alice was a patient at the Mont Park Psychiatric Hospital. 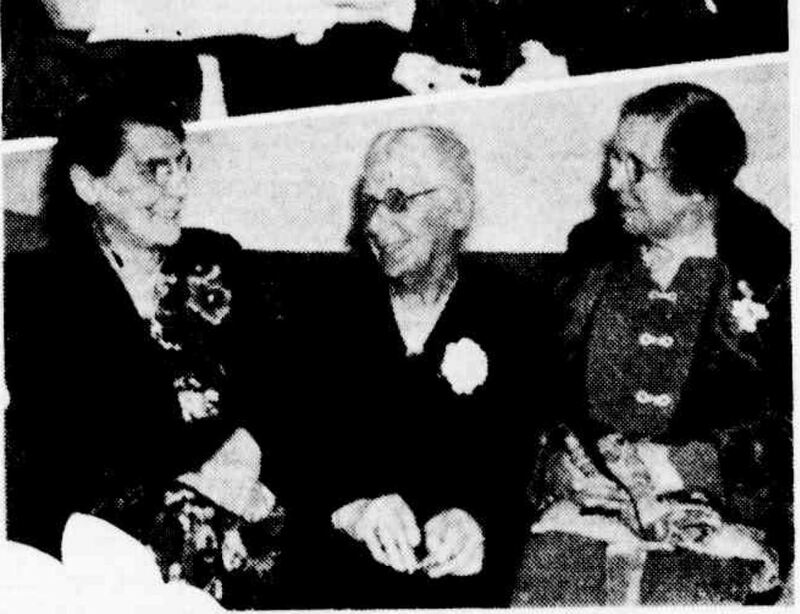 In 1932, Alice attended a reunion of Army nurses who served in India, Burma and Persia and is pictured below right. Alice’s mother Agnes died the following year at St Arnaud. Alice died at Elwood on 21 August 1959 aged eighty-four.